"I like how easy it is to put on and take off." My dog is partially blind and I was looking for a harness vs using his collar so that he would quit chocking himself when we go on walks. The harness has turned out great. It took him a little bit to get used to it but after that he was off and running. Also, I like how easy it is to put on and take off. "I am very happy with the harness and the service I received." I am very happy with the harness and the service I received. Heavy duty, easy on and easy off. Dog is not able to slip out of it. The best harness I've ever owned. This harness is great for a dog exceeding 35 lbs, but not less than 35 lbs. Works. Wish it sized easier. Well made harness, but a little difficult to adjust down. Should last forever! 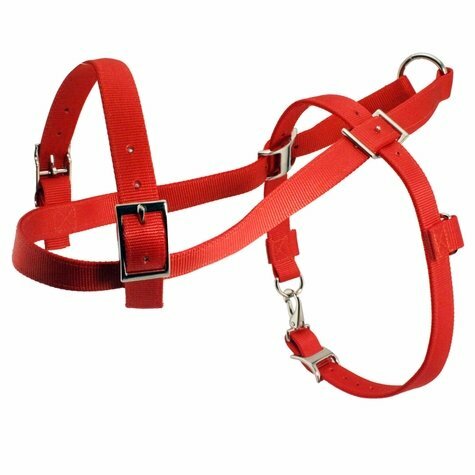 I ordered this harness for my Brittany, who is a large male. The harness is way to big for him, he slips right out of it. Roading Harnesses are used for exercising your dog. Put him in a harness and slowly walk him down the road. All of the pressure moves to his chest and takes the strain off of his neck. This adjustable nylon sled type harness is made of double ply 1" orange nylon, heavy nickel plated rings, buckles, and dees. The harness snaps under the belly.